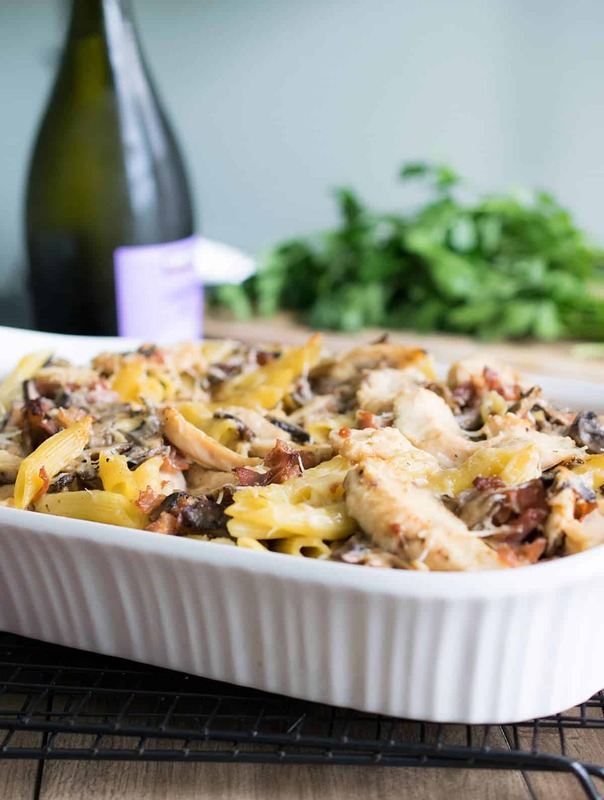 Creamy chicken Marsala pasta bake – A classic Italian dish with a bit of a twist. The flavors of mushrooms, prosciutto, and Parmesan cheese meld together to create a rustic, creamy dish to serve on those slow weekends and fancy enough for guests to enjoy! 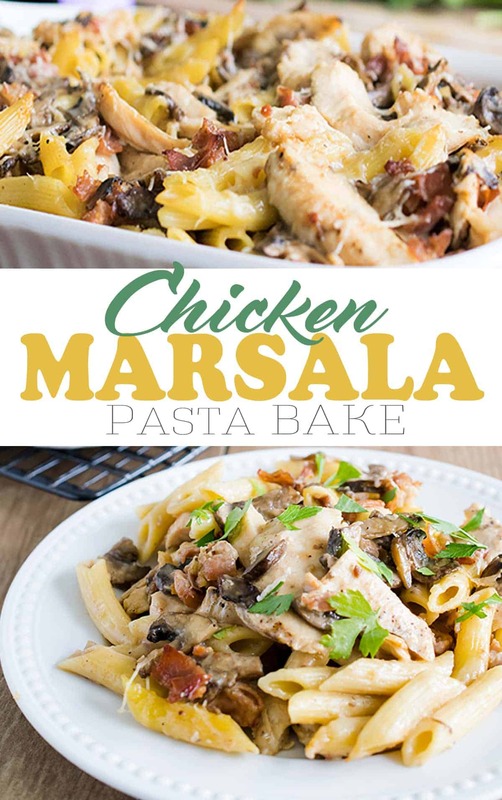 This Chicken Marsala pasta bake makes the best quick and tasty leftovers for those crazy busy weeks. It’s certainly been one of those weeks around here. I feel barely able to sit down even for a few minutes. Who doesn’t love a good pasta dish? To me there are very few things better than a big bowl of pasta, and this creamy, comforting chicken and mushroom combination is no exception. The pasta bake uses fairly simple, rustic ingredients like mushrooms, garlic, cream, parsley, grated cheese and a Marsala wine sauce. The prosciutto is a perfect touch to elevate this simple dish to extraordinary status. If you want more of a mushroom flavor, you could use Portobello or porcini mushrooms. Oh, and the best part about this dish? You only dirty one pan and one baking dish. I call less dishes an added bonus. Although I usually grill the chicken, it can be pan seared easily. For either grilling or sauteing, I find that using a good meat tenderizer to pound out the chicken to about 1/2- 3/4 of an inch to be the right thickness. Get that aggression out, haha! We always pound our chicken out, and I find that wrapping it loosely in saran wrap is the best way to keep the mess at bay. Quality Meat Tenderizer – I like a heavy metal one with a flat and pointed sides. Chef’s Knife : My brother-in-law has had a set of these for a few years and I prefer them over my super expensive Wusthof set. They feel very nice in hand, but the constant honing and sharpening is a little tiresome. If I bought another set, this would definitely be the one. What Marsala to Use in Cooking? Marsala wine is produced in Sicily. Marsala comes in both sweet and dry varieties and I usually use sweet wine with desserts or sweet dishes and dry wine with savory dishes. For this Chicken Marsala recipe, I use a dry Marsala. Honestly, in a pinch a decent cooking wine will do and it will taste great if your like me and you cook with wine much more often than you drink it. However, if you are looking for a better brand, Florio is a good one to try and you can find it at most liquor stores. There is a general rule that if it’s a bottle you would want to drink, it’s usually pretty good to cook with. Plus, you will have a bottle on hand to share if guests are coming! Pre-heat the oven to 350. Grease a 9x13 baking dish or spray with cooking spray. Cook pasta until aldente, drain, and set aside. In a large saucepan or deep skillet over medium heat, add olive oil and proscuitto. Cook until lightly crisp on the edges, about 5 minutes. Remove the proscuitto to a paper lined plate. In the same skillet, add the mushrooms and garlic. Cook until mushrooms darken slightly and the juices are released. Remove the mushrooms to the plate with the proscuitto. In same saucepan, melt the butter. Whisk in the flour and cook for 1 minute or until bubbly. Stir in the Marsala and bring to a boil for 1 minute. Add chicken broth and bring to a boil, then whisk in 1/4 cup of the parmesean until melted. Remove from heat and add cream and milk. Stir in mushrooms, procuito, and chicken. To the baking dish, add pasta and spoon sauce over the top. Lightly mix the sauce into the dish. Top with reserved 1/4 cup of parmesean cheese. Bake uncovered for 20 minutes or until the cheese melts and starts to turn golden. Remove and top with chopped parsely if desired. Thanks so much for sharing and visiting! I hope you get a chance to make it (and tell me how it goes!) 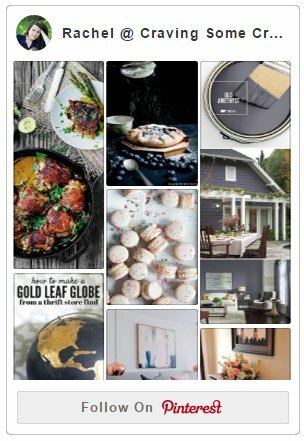 Love, Love your blog and your fun party! Boy does that look amazing or what? It’s almost too beautiful to eat, but I’d sure give it a shot. 🙂 Thanks for sharing, visiting from the Lou Lou Girls! Pinning! Yummy! I love all the ingredients in this dish and will have to give this a try. Thanks for sharing this. Oh my goodness this looks amazing!! I am a sucker for easy pasta dishes, there is nothing better for a busy night 🙂 Pinned and shared! Hopefully things settle down a little for you this week!